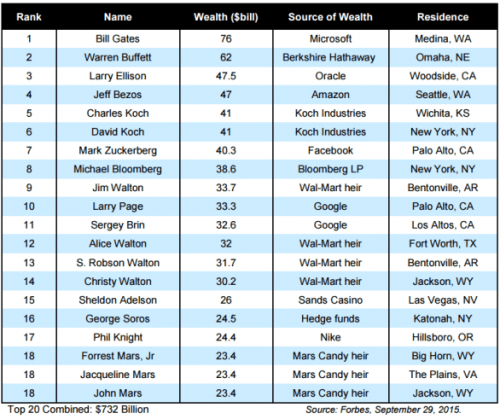 What does half of the US population have in common with the 20 richest people? We all know that wealth is unequally distributed in the US. But, the results of a new study by the Institute for Policy Studies, authored by Chuck Collins and Josh Hoxie, are still eye popping. Collins and Hoxie find that the wealthiest 0.1 percent of US households, an estimated 115,000 households with a net worth starting at $20 million, own more than 20 percent of total US household wealth. That is up from 7 percent in the 1970s. This group owns approximately the same total wealth as the bottom 90 percent of US households. Moving up the wealth ladder, they calculate that the top 400 people—yes, people not households, each with a net worth starting at $1.7 billion, have more wealth than the bottom 61 percent of the US population, an estimated 70 million households or 194 million people. The wealthiest 20 individuals in the United States today hold more wealth than the bottom half of the U.S. population combined. These 20 super wealthy — a group small enough to fly together on one Gulfstream G650 private jet — have as much wealth as the 152 million people who live in the 57 million households that make up the bottom half of the U.S. population. Although obvious, it is still worth emphasizing, as Collins and Hoxie do, that great wealth translates into great power, the power to shape economic policies. And, in a self-reinforcing cycle, the resulting policies, by design, create new opportunities for the wealthy to capture more wealth. Think: free trade agreements, privatization policies, tax policy, and labor and environmental laws and regulations. They are overwhelmingly white, rich, older and male . . . . Across a sprawling country, they reside in an archipelago of wealth, exclusive neighborhoods dotting a handful of cities and towns… Now they are deploying their vast wealth in the political arena, providing almost half of all the seed money raised to support Democratic and Republican presidential candidates. Just 158 families, along with companies they own or control, contributed $176 million in the first phase of the campaign, a New York Times investigation found (emphasis added). And yet, one still hears some people say that class analysis has no role to play in explaining the dynamics of the US political economy. Makes you wonder who pays their salary. Martin Hart-Landsberg is a professor of economics at Lewis and Clark College. You can follow him at Reports from the Economic Front. Posted on April 29, 2016, in politics/class inequality and tagged income inequality. Bookmark the permalink. 9 Comments. This article illuminated one gut-wrenching factoid after another. All of the data was staggering – but my mind wandered back to this statement – over and over again: .1 % of American households hold “the same total wealth as the bottom 90 percent of households”. 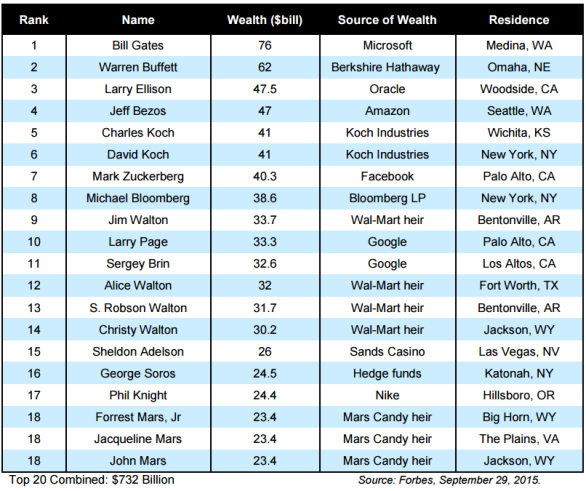 Nine of the “20 wealthiest individuals” belong to the same families! How does this come to be and why do we allow it to persist? We are an economic/political experiment gone mad. I find it difficult to believe that Adam Smith and other fathers of capitalism would support such an egregious distribution of wealth. America’s wealth disparity reflects neither privately owned enterprises and profits, nor individual industriousness. Instead it mirrors the inability of far too many to transcend systemic injustices that trample and exploit. How many times have we been burdened by the broken promise of fortune, prosperity and well-being that never seems to trickle down? Further, if the ‘game’ and its lack of rules has already been revealed, why do we so willingly continue to play? The wealth inequality of the U.S. is something that isn’t going to go away any time soon with all of the money that lies in politics. Sander’s has accumulated so much support from people by staying steadfast on his views. An unwavering, never flip-flopping view, that we should take care of the people of this country and not just the handful of billionaries. Hilary on the other hand had recently, had a dinner with George Clooney and his wife in the city of San Fransisco with the proceeds going to her campaign. The kicker, each plate was $100,000+ costing up to $330,000 to snag a seat with Hilary and Clooney… The venue was a Venture Capitalist’s home on Nob Hill. If someone who say’s they’re fighting for the people yet, taking hand outs that most likely come with some kind of expectation I can’t say that this is helping the country move away from wealth inequality. We really have to change the system of money in politics. Because typically what happens is that the people who refuse to take money end up losing. So it’s not enough to show good character. You can’t ask one side to unilaterally disarm — that will ensure that the other side wins. Bernie Sanders has been an exception — so far. If he ever actually got the nomination he could find himself at a disadvantage because too many people get their political information from advertisements during TV shows. At least Hillary is likely to appoint justices to the Supreme Court who will vote against citizens United — as all of the Democratic appointees did. If she ends up being the nominee and progressives don’t support her if, Republicans will appoint a bunch of big money-supporting justices, and it will be impossible to get money out of politics. I like Bernie a lot, but Hillary and has also done a lot of work to bring greater equality in terms of gender, race and class. Wow! The fact that the richest 20 people in the US share the same wealth than half the population is very sad and depressing.It really makes me wonder how or if they feel even a tiny bit guilty for the fact that there is such an enormous economical gap between us and them.It also makes me wonder if they are truly happy.I remember watching the movie The One Percent which was made by Jamie Johnson, the heir to the Johnson & Johnson pharmaceutical fortune.He decided to look into and dissect the issue by speaking to many different heirs one of which was Warren Buffet’s granddaughter.If you look at the chart above,he happens to be the second richest man in America.Turns out his granddaughter was not rich.She actually happened to be a maid for a rich family in San Fransisco.Despite that, she testifies to being very happy and content with life.She states that money is everything to her grandfather but not to her, that her art keeps her happy.In response to her being in the film and perhaps putting out negative aspects of him, Warren Buffet later sent her a letter stating that he no longer considered her family.It really is sad how money controls everything in certain aspects of life! Charles and David Koch are on that list. And they have been working hard to keep people from believing in climate change so that they can keep growing their money — which is largely dependent on carbon based energy. They are willing to let the planet experience use catastrophes: more and bigger droughts, Hurricanes, Tornadoes and the distraction of many coastal communities — so that they can keep all that money. Like they need it! I also saw that documentary from the Johnson and Johnson heir. And I have different feelings about Warren Buffett, based both on the interview with his granddaughter and knowing what he is doing with his money. The documentary shows that becoming an heir to a lot of money can often be hurtful, Keeping people dependent and unmotivated. It actually isn’t very healthy for people, and Warren Buffet is aware of that. So he pays for his kids and grand children’s educations but otherwise he expects them to be like the rest of us instead of being dependent on someone else’s money. And he is not ungenerous. He is one of the few rich people who votes against his interests, and who even lobbies against his interests — recommending a higher tax rate on the rich. And he is currently giving away at least half of his fortune before he dies. The only color that matters in American politics is green, who has, who doesn’t. It’s also the solution–GREEN–vote for the person who will protect the environment and the planet. Need to get $ out of politics!